The fun thing is that TeamCity.GitHub plugin reports that status for every branch. So to have statuses for branches you do not need even to update the plugin! Take a look what I see on my GitHub now! You can download a build from our TeamCity: here. 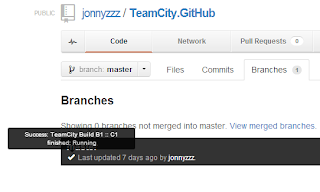 TeamCity.GitHub plugin is compiled with TeamCity 7.1. Is supports TeamCity 8.0 EAP and may work with older versions.